Explore the Shores of Lake Arenal & Enjoy an Array of Tropical Wildlife. If you are looking for a relaxed Costa Rica kayak experience – look no further! Lake Arenal is the largest and most important lake in Costa Rica. Man-made in 1974, it provides hydroelectric energy for the country. It is also a place where you can find many resident and migratory birds like the flycatchers, kingfishers, great blue herons, and anhingas, and sometimes mammals like howler monkeys can be seen in the surroundings. 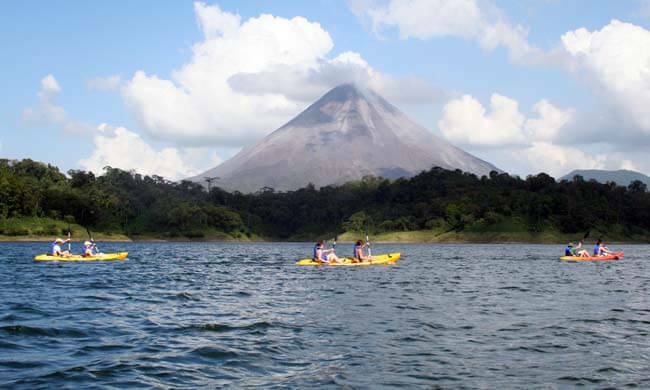 This is a great tour for anyone looking to enjoy a pleasant time kayaking on the calm waters of Lake Arenal with breathtaking views of the Arenal Volcano! Your day begins when you are picked up from your hotel and driven 30 minutes to reach Lake Arenal. When you arrive, your professional bilingual guide will get you ready to kayak. Experience the beautiful flora and fauna native to Costa Rica, exploring the lake’s shore. Beginners will learn basic kayaking techniques from your guide. Note: This tour is not extremely challenging, but you do need to be able to kayak for around two hours. Maximum weight is 200 lbs. What to bring: Comfortable clothes, sandals, sunscreen, repellent, camera, binoculars, towel, a raincoat or rain jacket.